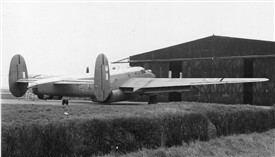 Aircraft: Manchester; Hampden; Lancaster; Horsa; DC-3; C-53; Waco glider; Hadrian glider; Halifax; Hurricane; Spitfire; Bristol Freighter; Beechcraft Expeditors; assorted Avro airframes including Shackletons. Things of note: Unusual in that it had a dual military and civilian (A.V.Roe) use from 1942 - A.V.Roe ceasing operations in 1968, with this company undertaking major servicing activities on aircraft like Shackletons. Current status: Currently an active airfield for parachuting with the British Parachute School being based there; and a public viewing area is accessible. 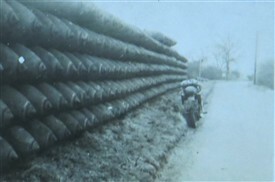 Some original buildings survive and have an industrial use, including part of the former A.V.Roe facilities. 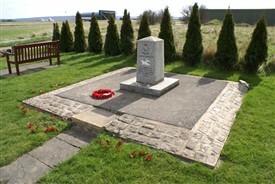 Located on the edge of the airfield is the 207 Squadron memorial at grid ref: Sheet 129; SK734333. A Memorial Book to 207 Squadron was also placed in St. Andrew's Church, Langar. This page was added by Howard Heeley on 14/11/2014.